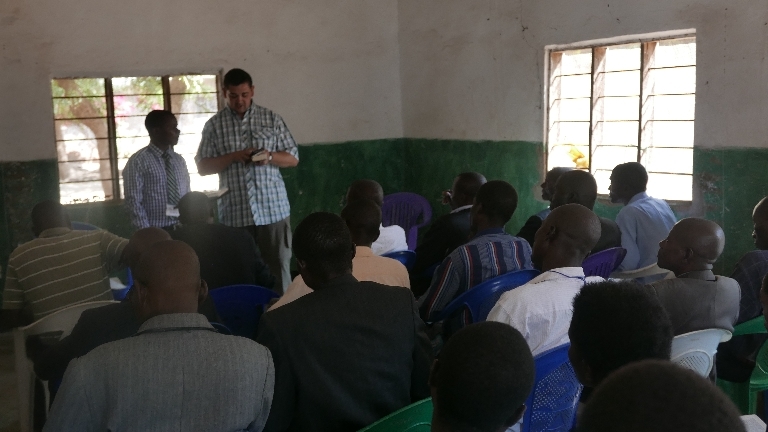 Joey teaching advanced class with Pastor Samuel translating. Today we start having ten sessions of classes per day. The Returning Student class that meets in the small classroom is smaller than expected, which is fortunate because that room is hot and crowded with just 33 students. 40 would have fit, but the extra breathing room is nice, and the smaller class size allows more interaction. Joey and David are the main teachers for this small group. They are determined to find out more about the students and learn more about life for a village pastor in Malawi and not just teach. We have already visited two small rural churches, one in Blantyre and one in Nsanje. We viewed the inside of houses and walked through the villages. 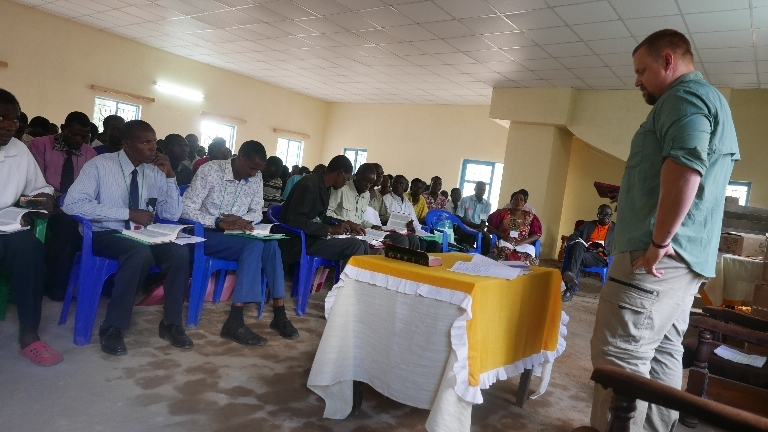 On day two, David planned an easy class called “Who am I” and taught 30 powerful verses and how to use them to encourage themselves and others. Then he told them how he was saved and got 7 volunteers to tell how they were saved. More than half were saved by attending a crusade, which is also the method Pastor Chilemba uses. They are as effective in Africa today as they were during the great awakening in America 100 years ago when great American Evangelists like Billy Sunday and D. L. Moody had huge evangelistic crusades. Billy Graham followed in their footsteps and soon became a mighty force for God in the 1940’s and beyond. God is always at work and now He is working powerfully in Malawi and Mozambique. His name is indeed being exalted. Many unexpected changes occurred, but both the teachers and the students adapted well to the surprises. For example, there were permanent markers mixed in with the dry erase markers, so we accidentally wrote on one whiteboard with a permanent marker and could not use it. However, since Nsanje has grown, over lunchtime someone went and found the local equivalent of Goof-off and removed the “permanent” while we were at lunch – no big deal. In the small classroom, the stick up white board material we brought with us from America would not stick to one of the walls we wanted to put it on, so no big deal, suddenly everyone grabs there chairs and benches and the room is rearranged. No one in Malawi is stressed by changes, this is Africa and changes are expected and part of the fun. As a team we are learning this attitude too. Once we realize that we are not disappointing the students when things do not go as planned, we relax into the flow that is Africa, and the ride is actually fun. Praise the Lord for this extraordinary life changing mission — life changing for both students and teachers. Pray for protection, wisdom, guidance for us. We thank God for all of you. The church here prays for all of you. 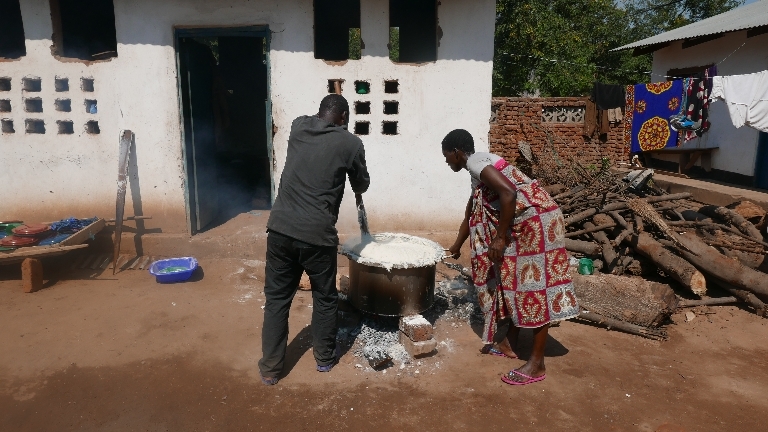 Cooking maize for student lunches. Joey teaches how pastors can create a thunderstorm effect in the ‘new big church’ by clicking their fingers. 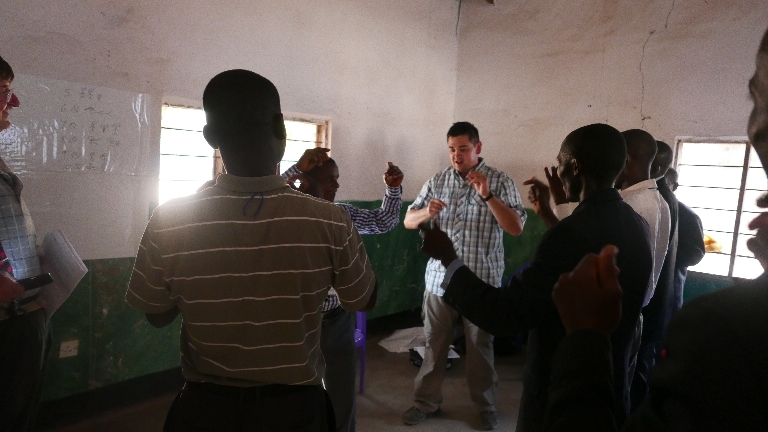 Ian teaches and John Chilemba translates for first year students.